Having arrived back in Australia after Ten weeks in Europe with camera cards bulging and a loop of experiences on permanent replay in my head. a) Italy Rome, Amalfi Coast, Sicily? b) Slovenia the beautiful, Piran and Ljulbjana via Triglav National Park? c) Croatia – Zagreb, the National Park, Seaside Towns and Islands? d) Bosnia & Hercegovina (BiH) and Montenegro Across border explorations? So good we visited twice. 22nd April – 26th April. Glory is a word associated with Ancient Roman Empire but it was equally applicable to our first four days in the eternal city. With predominately blue skies and few crowds, Spring added a bounce to my step that made exploring Rome a breeze. With long day light hours we left our Airbnb room in Trastevere by 9.30 a.m. allowing a good eleven hours to walk around the sights. It was as if Rome knew we had not seen her for a while and wanted to impress. 27th June – 29th June. A slightly different Rome greeted us at the end of June. Temperatures were above 30 degrees and our days were dotted with Cafes and the cool interiors of Churches. The non-existent Colosseum line of early Spring was replaced by a sluggish swollen one that oozed toward the Arch of Constantine. There is no way I would have joined that queue. The combined Colosseum, Palatine, Forum ticket (12 Euro) can be purchased on line, avoiding the queue. If buying in person do so at the Palatine which is usually less crowded. Meander around the Palatine first, exiting directly into the forum and then through the Forum’s exit only gate to the Colosseum. 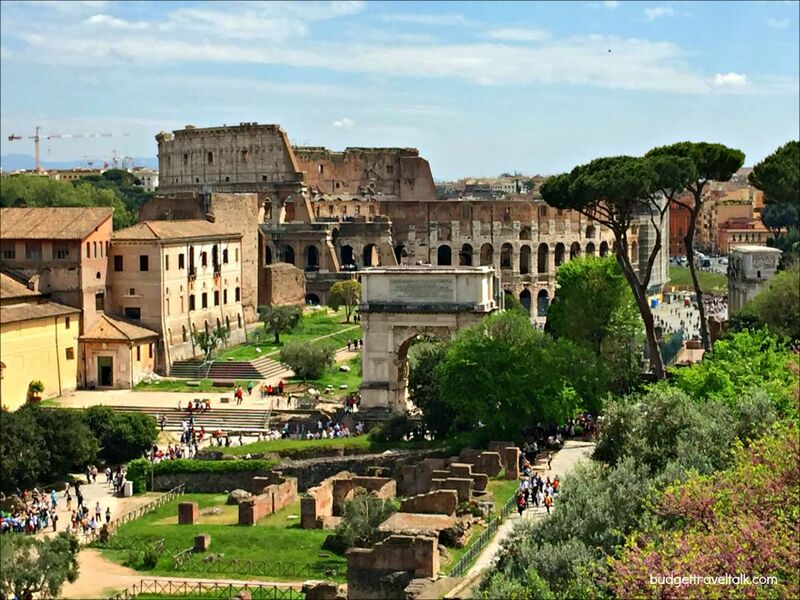 It is not possible to change the order to Palatine>Colosseum>Forum as the latter is considered part of the Palatine park and the auto gates will not re-admit into any sector! It is true that when we visited the Colosseum we didn’t hire a guide and although it was an wonderful experience I do think we would have had an enriched experience if we had one. This was definitely the case with the Forum and although we revelled in wandering around Palatine Hill some guide input would have been welcome also. 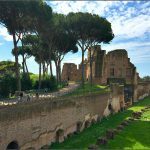 CLICK HERE TO ORDER A SKIP THE LINE COLOSSEUM/PALATINE/FORUM GUIDED TOUR. I recommend this trio of attractions to anyone who hasn’t been before or who like us, wants to get reacquainted. The Colosseum has a capacity of 3,000 persons so even with a pre-purchased ticket it may still be necessary to queue to gain entry. as the best time to visit Rome. Three wonderful days filled with April Showers. Arriving at Positano by boat from Salerno meant fighting our way upward against the flow of people. Salmon swimming upstream to spawn had nothing on us. I was shattered. Was Positano always like this? No – It was the day after Liberation Day and the coast was crowded with extra holidaymakers. Upon reaching the square we didn’t die, but caught the Interno bus, whose circular route through the village was the perfect antidote for screaming muscles. Parking our luggage at Fornillo stop, we alternated searching for the guesthouse, eventually locating it at the bottom of some invisible cut-back stairs. 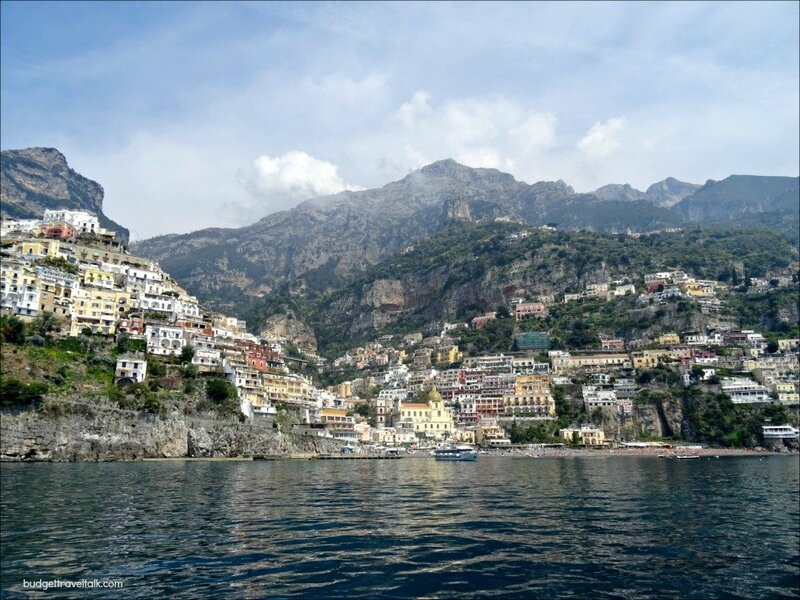 Positano and stairs are as intertwined as a pair of latin lovers. Once inside the guesthouse there were another two sets of internal stairs to tackle before stepping onto the terrace – slap bang into that view. If only Pot Plant Kitty could have pointed the way. Positano’s vertiginous coloured houses versed blue ocean. I could have spent the entire three days there on the terrace. 29th April to 1st May. 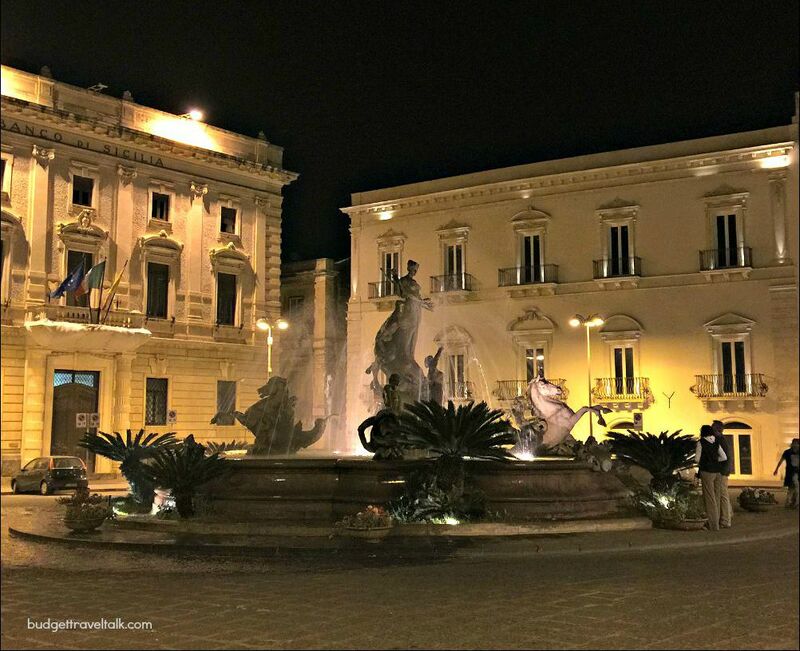 The perfect staging point for both our Amalfi Coast and Pompei visits, Salerno was also the departure point for the next leg of our journey by train to Sicily. We loved being privy to the every day life of this non-touristic Italian Town. It had a quirky fetish for hot chips served with an astonishing choice of sauces, squeezed from udders swaying from a carousel. While I gaped in astonishment Marty was busy ordering a biggest paper cone full of chips I’d ever seen, and that was the medium size. Salerno’s Potato Chip addiction was fascinating. Although Sicily is not a stand alone Country it deserves it’s own heading. Having joined Italy in 1860, it was recognized as an autonomous region in 1946. The train from Salerno delivered us to Giardini-Naxos without any of the problems we’d been warned about (we should have known) and onwards to Siracusa where we collected a rental car and drove to Modica, returning it in Palermo five days later. Another five days flew by in that chaotic and surprising city, before we transferred to Trapani by bus. Our Sicilian adventure ended with a Ryan Air flight to Trieste in the North of Italy. Mt. 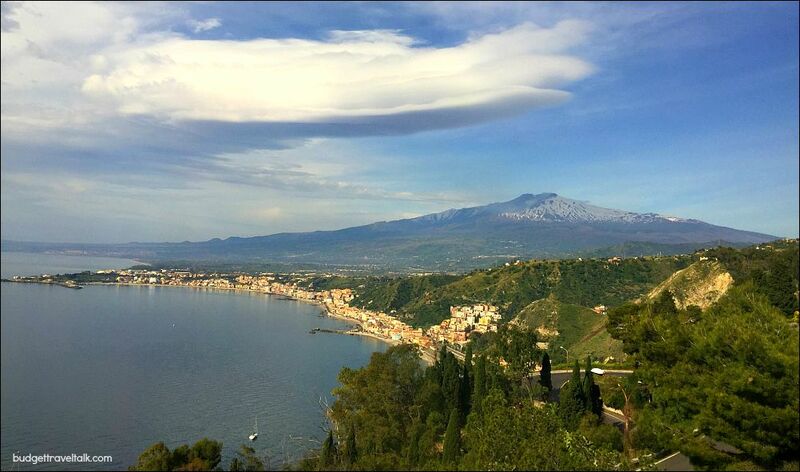 Etna and Giardini-Naxos from Taormina. We stayed three nights at Giardini-Naxos, a down to earth beach-side town popular with Italian families, while on the hill above posed the more glamorous and upmarket Taormina. Like Trenitalia who named their train station Taormina-Giardini, I think of them as the one destination. Paola, the hostess at our Airbnb beachfront B & B had such a happy and genuine presence that I couldn’t help loving her, even before I discovered she moonlighted as a food blogger. Paola indulged us with her home-made cakes for breakfast served with brewed Italian coffee. When I complimented her on how tasty the fresh squeezed orange juice was, she smiled and agreed. The reason was simple. Sicilian first and Italian second. Otto Geleng the German artist who in the 1860’s painted Ampitheatre at Taormina complete with the Bay of Naxos and Mt. Etna, was labelled a fraud in Berlin and Paris – surely nothing so outlandishly beautiful could be real? He in turn invited his critics to return with him to Taormina and see for themselves, offering to pay their fares if they still thought him fraudulent. As I stood in the Taormina Greek Theatre looking across to snow covered Mt. Etna with the bay below and the Ionian sea filling the frame, it did seem a little too good to be true. It seemed fitting that we visit Mt. Etna as well thereby completing the three components of Geleng’s painting. Ortygia the island is connected to the mainland Siracusa by two bridges. The island is more like a mini peninsula, jam crammed full of atmospheric lanes, elegant piazzas, a lively market thirty-nine churches and the elegant Duomo Piazza. Once upon a time a majority of the old limestone buildings had fallen into disrepair, but with the recent boost in visitor numbers more and more of them are getting the attention they deserve. 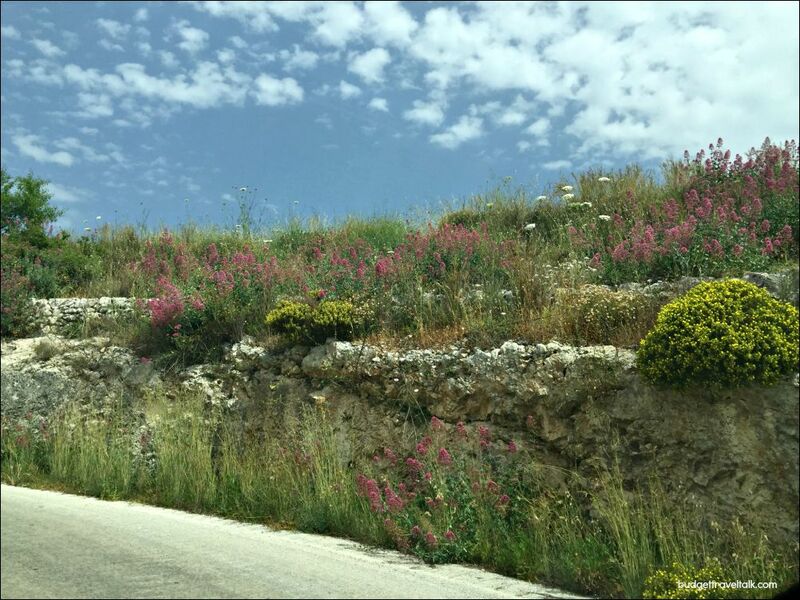 Spring Road Trip from Siracusa. As Marty hadn’t driven on the other side of the road since our 2013 road journey through Eastern Turkey, we pointed our newly collected rental car toward quiet country roads for a bit. Just as we were leaving, our Airbnb host mentioned the Necropolis of Pantalica where 4000 prehistoric burial chambers could be found. The site was added to the Unesco World Heritage list along with Siracusa in 2005. Our original plan of driving directly to Modica was lost on country roads in search of Pantalica. Those roads framed by stone fences and wildflowers reminded me that being spontaneous was fun. Coming from Siracusa, we approached the site via the town of Sortina and after a lot of zig-zagging and back-tracking we found the tombs cut out of extended rock faces across a valley. There was an attendant at the start of a cross valley walking track but we found it difficult to communicate. We had run out of time anyway, but one day I would like to return and do that hike. After only three nights in the previous two stop-overs and we were looking forward to five nights in Modica. This town of 50,000 people is known for it’s late Baroque period architecture and we used it is a base to explore other Baroque towns and the Mediterranean coast. It’s multiple entrances and exits, were confusing at first and the oldest part of town sat on a high ridge between two valleys which translated to stairs and more stairs. Passeggiata, the traditional Italian evening see and be seen stroll was alive and well in Modica, where even the cars quirkily joined in. Passeggiata time meant the streets of the lower town would inevitably be bumper to bumper. This was our time to buy a Gelato, pull up a seat and watch the parade. This rooftop view encapsulates the different levels of Modica. Taken while descending from the wonderful Sicilian Baroque Duomo di St. Giorgio in the late afternoon. 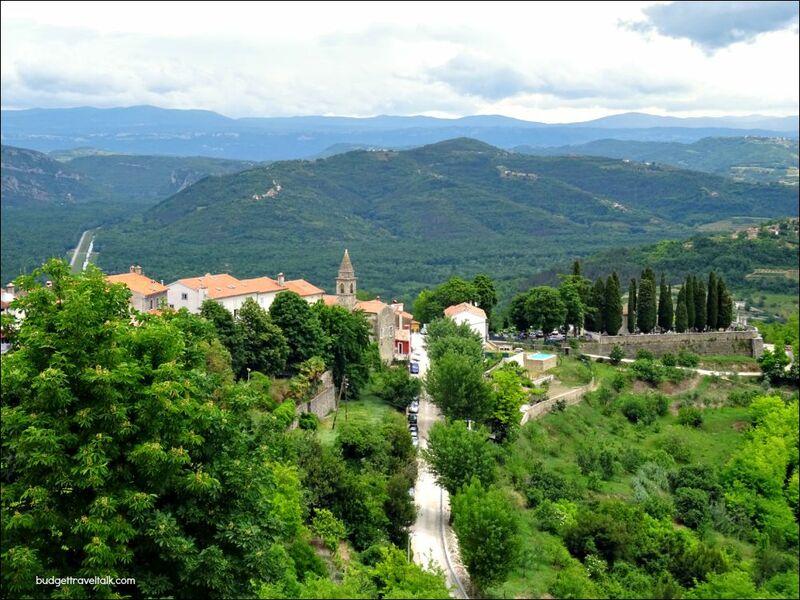 Croatian Hilltop village of Motovun in Istria. Istria is a peninsula district shared by Italy, Slovenia and Croatia, but the majority of it -89% in fact – is Croatian. On arrival at Trieste Airport in Italy we were whisked away by relatives for a whirlwind five day stay at the coastal town of Umag in (Croatian) Istria. Together we visited nine seaside and hilltop towns, and on reflection, we didn’t spend much time in Umag at all. There were drinks on one of Umag’s waterfronts and happy hours filled with wine, cheese and olives, on the verandah of their Airbnb place. It was wonderful at the half-way point of our trip to literally take the back seat and be shown around the hilltop and seaside towns of Istria. 24th – 30th May. Jenny from A Taste of Travel, was a major source of destination inspiration for our ten weeks in Europe. 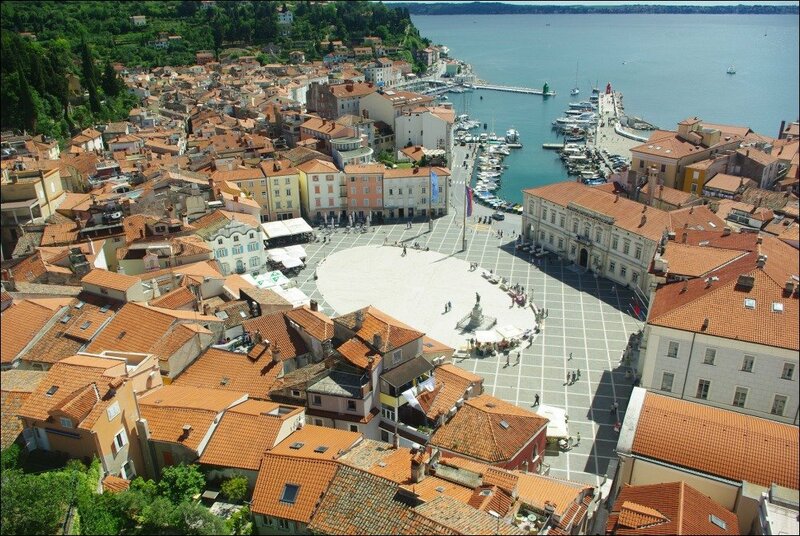 She suggested we would love Piran, a Slovenian seaside town just over the border from where we were staying in Umag, Croatia. I really wanted to visit Piran, but was struggling to fit it into the tightening schedule. We ended up stealing a day from the drive from Piran to Ljubljana through the Triglav National Park. We walked the town walls, explored lanes, found a hidden Piazza and earmarked a casual hole in the wall cafe for dinner. There were Aperitivos on the waterfront, a sun set over the ocean and lunch in a cafe we accidentally discovered while looking for another. A climb to the top of a bell tower left us with ringing ears while choir song floated delicately in the air at a nunnery we peeked into. If ever a country was to be described as perfect, it could well be Slovenia. The drive to Lake Bohinj and Bled and our subsequent stay in Ljubljana the Capital, sealed the deal. I’ve long since forgotten where I read these words but I totally agree with their sentiment. Any Itinerary is improved by the addition of Slovenia. 30th May – 2nd June. We approached Zagreb the Capital of Croatia by train from Ljubljana. On boarding we found a compartment with eight seats and only two occupants, with every spare seat filled with luggage. No doubt it was a ploy to deter newcomers as this was a long distance train that originated somewhere in Western Europe, but having been given the once-over we were accepted and the offending luggage rehoused. By the end of the journey we were friends with one half of the carriage, a young Croatian woman, who was met on arrival in Zagreb by her waiting family. With a formal introduction and welcome under our belt, we were swept into the street in a flurry of people and luggage, most of which it seemed belonged to our new friend. What a welcome to Zagreb. Allocate six hours to walk the myriad pathways, luxuriate in the cool blues and greens, the splash of gushing waterfalls, the chorus of happy frogs, the lazy schools of fish and if you have planned well and arrived very early, possibly a moment to enjoy the solitude. The highlight of Croatia is her islands. Vis Island – 10th June to 16th June. Looking at a map of Croatia and the Adriatic you can see Croatia’s islands strewn lengthwise, close offshore and along the whole length of the coast from the Istrian peninsula in the north to Dubrovnik in the south. 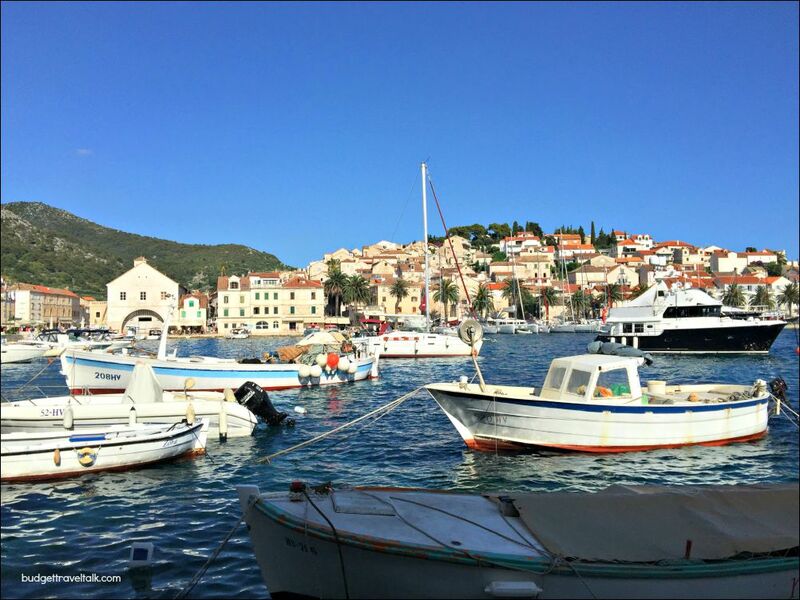 We visited Vis and Hvar Islands both of which are located near Split more than half-way down the coast of Croatia. We recommend these two islands both for their proximity to each other and their individuality. 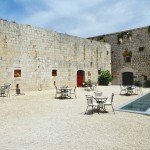 Hvar Town, Hvar Island – 16th June to 20th June. 24th June – 27th June. There is a lot of hype surrounding Dubrovnik. We tossed around the idea of not visiting this sparkling jewel at all – I mean we’d already seen quite a few walled cities. All that I can say is that we were wrong to consider not visiting Dubrovnik and that it’s charms over-ride the overwhelming tourist presence. When at the top of Mount Srd, Dubrovnik’s backdrop, be sure to visit the War Museum. It has great footage of when Dubrovnik was bombed during the Croatian War of Independence (1991-95). The roof of the Museum is the best place to photograph the old town from above and capture the Adriatic at sunset. Zadar – 3rd June – 5th June. There is a link to a post outlining the innovative waterfront attractions of Zadar at the bottom of this post. We drove directly to Zadar after leaving Plitvice Lakes. Plitvice was all about pristine lakes and our Airbnb place in Zadar was on the waterfront, which meant seaside promenade walks and being right in the old town. The Croatian town of Split is not only a departure point for the Islands but a destination in itself. Split – June 7th – June 9th. Being the departure point for Vis and Hvar, meant Split was a given, but we enjoyed the modern looking promenade with ancient Diocletians Palace behind, the quietness of the backstreets where we shared an Airbnb house and riding bicycles along the coast. After using four different car rental companies in ten weeks, the one we tried at the last minute out of Split was the most efficient and best of them all. Last Minute Rentals, Tomica Stine 9, 21000, Split, Croatia. A flying visit on 21st June staying overnight in Trebinje. We were not in BiH long enough, but what we saw was intriguing. After visiting Mostar for it’s 16th Century Ottoman Bridge and Stolac for it’s demolition in the war and ultimate rebuild, we arrived in Trebinje, part of Republika Srpska in East Hercegovina. Trebinje (BiH) and Dubrovnik (Croatia) are only 33km from each other, but after the Croatian War of Independence and Trebinje’s role in the bombing of Dubrovnik, neighbourly relations are somewhat frosty. The people in both towns were friendly and welcoming but for an outsider, the intricacies of the not so distant war are difficult to grasp. 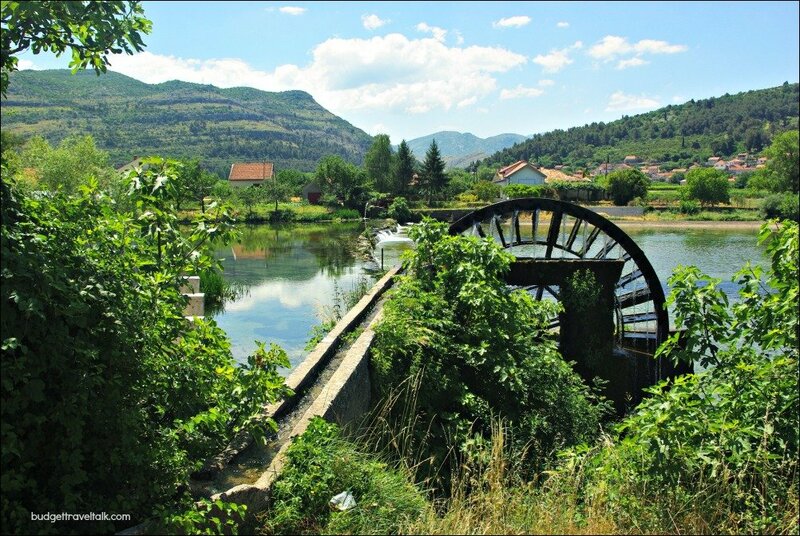 We were captivated by Trebinje and made an impromptu decision to stay overnight. The many and popular bars of the old walled town, the old looking but still in use water wheels that lifted water from the Trebišnjica river and the endangered Plane trees that towered over a market that sold soft cheeses stored in animal skins, were all part of the initial attraction. There is much to see in the surrounding area and given the chance, we would definitely return. I do hope we get the chance to visit the Bosnian capital of Sarajevo at some stage in the future. The Bosnian War of independence, raged from 1992 and finished in 1995. There are scars in Bosnia – some, like the bullet holes and ruined buildings can still be seen. 22nd June – 24th June. I have one piece of advice to offer when visiting the Bay of Kotor in Montenegro. Enter Montenegro at the BiH/Montenegrin high mountain border crossing near the town of Vilusi, accessed via Trebinje. Not only is the mountain and river scenery on the BiH side of the border fantastic, but the Montenegrin section of the route ensures a first sighting of the Bay from a lofty height. While it is true that ascending the mountain from Kotor after arrival via the other coastal route from Dubrovnik would give the same view on descent, it would not have the same impact. The below map shows a circular route to and from Dubrovnik. which has moved into a difficult adolescence. The final stage of the drive from Kotor to Budva offers beautiful scenery from the high mountain road, plummeting over forested slopes to the glistening blue ocean and beaches below. 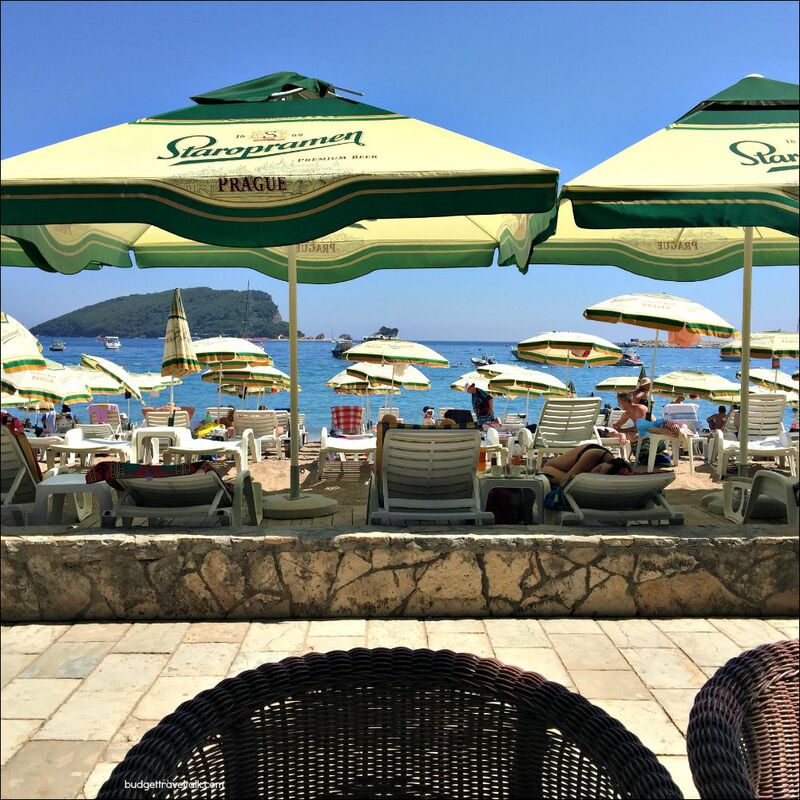 Having parked a fair distance from the old city, we ran the gauntlet of carnival inspired souvenir stalls, making our way along the beach-side path, stopping at a waterfront bar for some iced coffees and to take in the scene. It was tempting to sit longer people watching, but soon we were moving past an ever changing canvas of sun lounges, in blocks of solid colour denoting ownership. It was a very different beach dynamic for us, but it was a vibrant one full of happy holidaymakers. Eventually we reached two Marinas and an old walled town right on the ocean. The walk back on the street parallel with the beach path revealed some weird and wonderful Vegas meets Phuket style bars/clubs who like entertainers everywhere, were having final make-up applied before the main act – the crush of July/August. I guess it’s worth remembering that while adolescents can be difficult, if viewed with the right attitude they can also be entertaining and may even morph into well-rounded adults! Let me know in the comments which area you would like to hear more about. We’ve accumulated budget eating and sleeping options and have tons of photos to share. These posts were written on the road. Posts written since our return. Lake Bohinj hidden gem of Slovenia. Campo de fiori – a market that grew from a roman meadow. Rastoke Croatia – a taste of Plitvice Lakes. Surprising Neretva River in Bosnia (BiH). 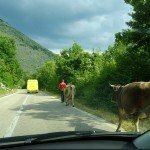 BiH Roadtrip Mostar Stolac Radimlja Necropolis. Following the Yellow bus to Trebinje in BiH. 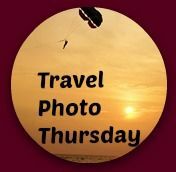 This post is linked to Nancie’s Travel Photo Thursday over at Budget Travelers Sandbox, Noel’s Travel Photo Monday at Travel Photo Discovery and Malaysian Meanders for Weekend Travel Inspiration. Oh my! Those photos alone left me wanting to follow in your footsteps and then your descriptions were the icing on the cake. 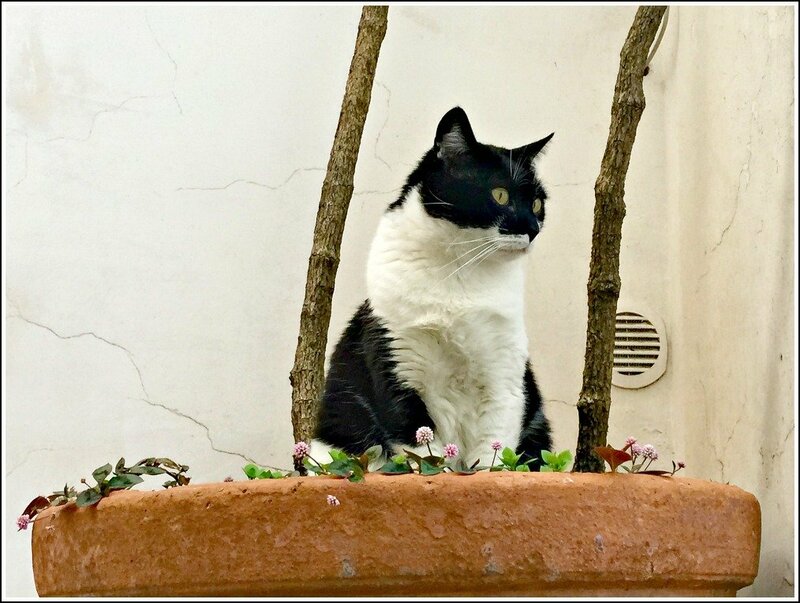 Absolutely love this post – the roof tiles might have been my favorite photo as I am a shutterbug when it comes to those fabulous tiles. Thanks Jackie. Which place would you like to hear more about? Wow! So may great places! 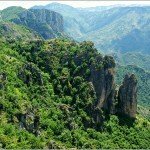 I would like to read more about your experience in Sicily. 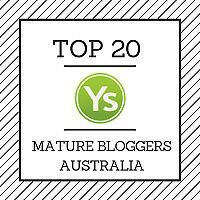 I guess you would have blog material for a long period of time. Jan what a fantastic trip you had. You covered all of my favourite European places that I want to see. I am very interested in doing Italy and maybe a Mediterannean cruise encompassing Croatia and Montenegro. I will look forward to reading more. Thanks Kathy. Have you been to any of those countries before? 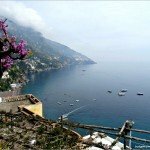 I would love to hear about the Amalfi Coast, it looks breathe taking. What an incredible 10 weeks! I can’t decide what I want to hear more about. I bet you have loads and loads of amazing photos to share. Whatever you decide to write about, I’m sure that it will captivate me as always. Oh my goodness, that view in Positano! No wonder you didn’t want to leave the terrace. Those waterfalls in Plitvice Lakes are really interesting, too. I need to get myself over to Croatia. 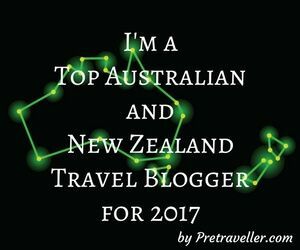 Thanks for linking up with #WkendTravelInspiration. Sicily is lovely – quite different to the rest of Italy. What a fabulous trip!! Looks like you had an incredible adventure! I loved our time in Sicily. Did you go to the catacombs in Palermo? That was one of the things that I remember the most from our time there. No I didn’t Ellen. I went to something similar in Rome a long time ago though 🙂 Sicily was a wonderful destination, so many different aspects. Thanks for the feedback Carolann! Wow! That was a really great itinerary Jan. I’ll bet you do have tons of info and many more photos to share. I’m especially interested in your thoughts on Slovenia. We most likely will be going very soon! Beautiful. Slovenia is an easy country to visit and love Corinne. We were there for one night in Piran, two at Lake Bohinj/Bled and three in Ljubljana and it would have been good to have another week to drive around the rest of the Country (at least). We spent about 6 months in Europe in 2012 and only overlapped Italy with you. Looks like a great trip. 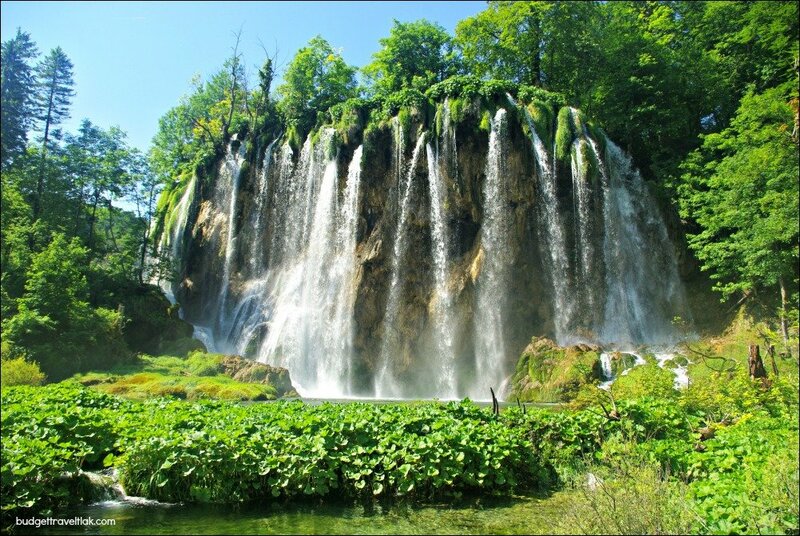 Love your photos, my favorite being the waterfall in Croatia. Rhonda that waterfall photo is one of my favourites too because it reminds me of the 6 hours we spent in a wonderful national park centred entirely on the lakes. It is only one of many at Plitvice Lakes, Croatia. Lots of good walks there for you to do! I do have so much to blog about Shobha. I alternate between being overjoyed and overwhelmed, lol. 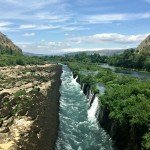 Beautiful photos of some amazing places!! Would love to hear more about Croatia as it is climbing to the top of my list of where to next! Hi Sally, Croatia is a wonderful country to visit, I have so much to blog about Croatia! you really have an eye for photos. the one in Rome is fantastic. I was never able to capture that city the way I wanted. Start in Croatia. I’m curious about it. Oooh Eileen I think your vote for Croatia might have tipped the scales. 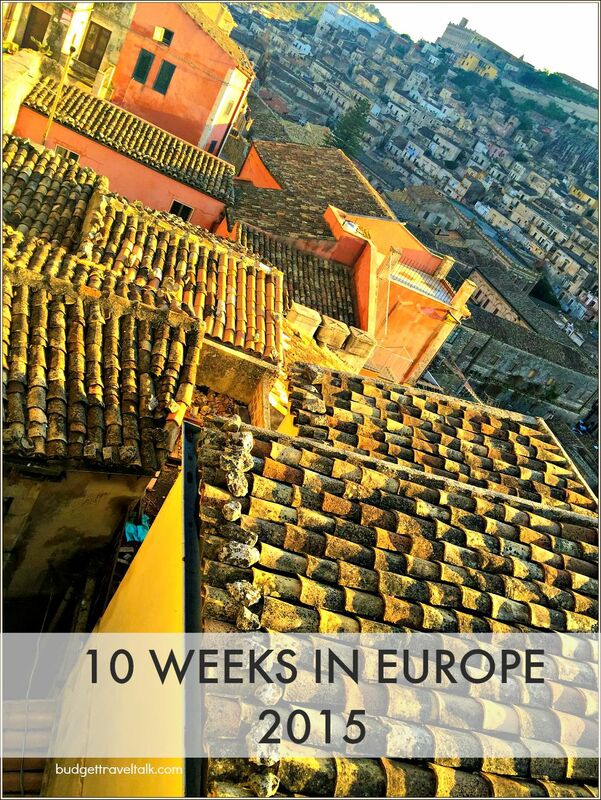 I have a post nearly ready to publish for Amalfi Coast so Croatia might be next. Any part of Croatia in particular? What a fabulous trip, I think I would have done the same trip except that I haven’t been to Montenegro and Sarayevo. Also Albania is on my list to visit. But my favorite to do now would be to see Sicily and eat some amazing food there! Hi Noel, I so nearly went to Sarayevo but didn’t have enough time. Trebinje was a wonderful surprise though and we would not have stayed there if we had been to Sarayevo so it was meant to be. You went to Positano! That’s on my list of dream destinations. I saw it on featured on a travel blog once and I’ve wanted to go ever since! Siracusa also looks very beautiful! That’s two requests for Slovenia. Thanks Jo. Thanks Nancy. 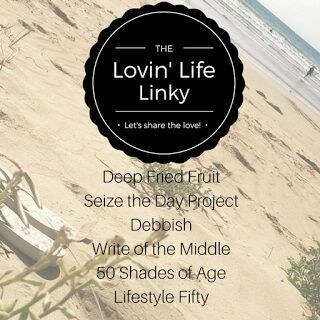 It was a good Itinerary – Jenny from A Taste of Travel gave me lots of ideas. I left the planning of Bosnia until the last minute and in retrospect I would have liked a few more days there to visit Sarajevo and spend more time in Trebinje. I loved following your trip Jan. It bought back memories of our visits to those stunning places. I know that overwhelming feeling…there’s still a lot of posts to be written about our trip! I am looking forward to reading them Jenny! Sicily. I know lots and yet nothing about Sicily. Sounds like an amazing trip. Stunning pics. Sicily is well-worth visiting. I loved it. Jan this looks like it was an amazing trip. 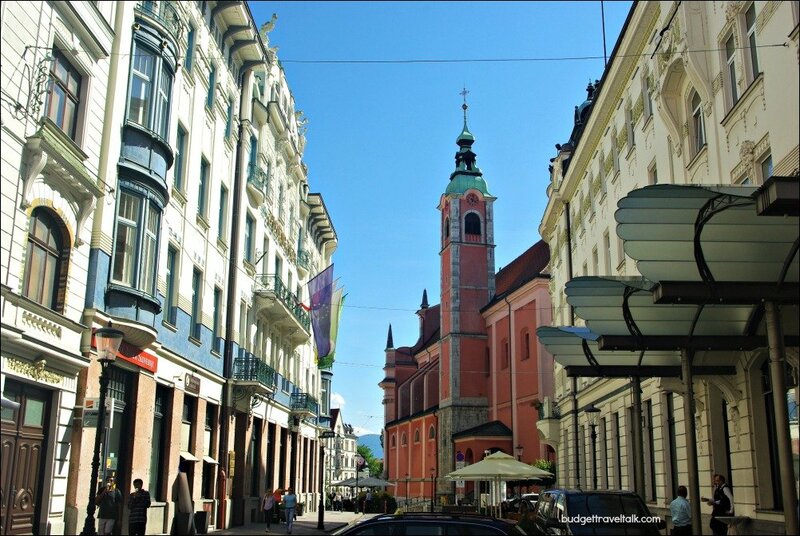 We did 6 weeks last year and visited only one place included on your itinerary, Lbubljana. We did get to Italy and the Amalfi coast back in 2013 though and have to say it was a highlight. Still so much to see, thanks for reminding me and keeping them on our radar.